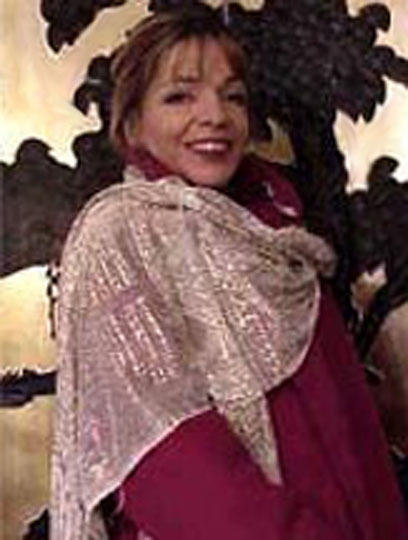 There are many ways to use an assuit shawl as a garment without having to cut it. If the shawl is in good condition or is large and/or especially interesting in pattern, I personally feel that it should be left intact as the beautiful folk-art treasure that it is. Throughout this page, click on any photo to see it in more detail. This is a simple yet dramatic treatment for very large and heavy pieces. Just hang around neck and adjust the coverage, then put on the belt over it to hold it in place. 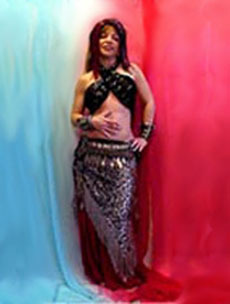 This is also a really good look for male belly dancers! Use two shawls for a butterfly effect. Put one on each side and double your pleasure. So Classic. This is an opulent, historical, and graceful treatment for medium to lightweight assuits. Practice a lot before performing. Step 1: Tuck in across back of harem pants and "run through" to the front. Step 2: Tuck loose end into the front of harem pants, spread across front. Be careful when you dance! This offers more coverage than the Turkish Run-Through Skirt described above, and it has the look of a full-length garment. Step 2: Continue the run-through under the belt and up to the bra. Tuck into straps and top of bra edge. A vest or choli on top is a great option as well. 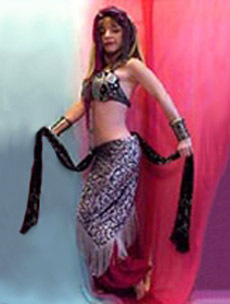 Step 1: Unlike the Turkish Run-Through, the middle of the shawl is put inside the harem pants next to the body and "run through" the legs rather close to the body. That’s right – like a diaper! Hang up and over the elastic or hip scarf. Step 2: Adjust and spread across back. Step 3: Adjust across front. Ta Da! A straight panel assuit skirt with no cutting! Most effective with a dark assuit. Wear over dark harem pants or another straight panel skirt as a lining. 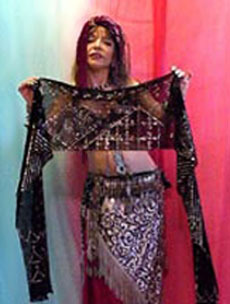 You can even use over circular panel or gypsy ruffle skirts that are wrapped tight around the hips for look of an ancient Priestess of Crete. Hang around neck, cross in front, and tie in back carefully. Then be brave and bold and wear it to your next party or night club (with your favorite pair of black pants). With rings on your fingers and bells on your toes, you will have sizzle and glamour wherever you go! Step 1: Fold in half lengthwise. Step 2: From the center, grab two points wider than your shoulders and tack with a few small stitches. Remember, no safety pins! Step 3: About 8 inches (20 cm) out from those tacks, tack again. Sew through the rolled edge of the assuit for stability, but don’t sew so tightly that you couldn’t open it back up again. This is great over or under a bra or choli or under a vest. It shows off all the assuit pattern. Last, but not least. An assuit piece makes a jaw-dropping entrance to any special event when draped over a warm winter coat!. This is just a starting point for enjoying and wearing assuit. I’m sure you can think of many more. The important thing is: Don’t leave them in drawers! These antique assuits are some of the most beautiful textiles our species has ever created, and they are basically a lost folk art, for the new ones will never compare. So wear them as much as you can in as many ways that you can, that they can be shared with others, and love them forever. About Assuit. Overview of this textile and its history. By Trish St. John. How to Care for Assuit. By Trish St. John. Laundering and other care issues. Hello friends. I am Trish St. John, also known as Hanan. My love and passion for the beautiful antique textiles that we know as assuit has led me to write this article. You can contact me through my facebook profile. 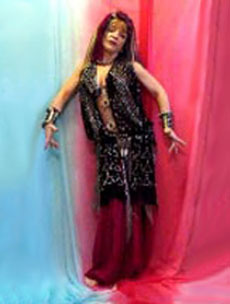 In addition to being a collector of assuit and designer of garments made from it, I have been a performer of Middle Eastern dance for over two decades. It was early in my path of Middle Eastern dance study that my passion for beautiful assuit textile was sparked. My fascination with assuit and all aspects of costuming has been as enjoyable for me as the dance itself. I began taking classes in what is now referred to as American style in the early craze for belly dancing. 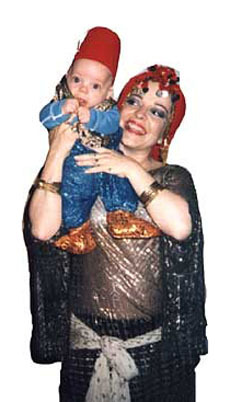 I had never even seen a belly dancer before my first class, but I was drawn to that first class like a date with destiny. It certainly was just such a date, because my connection to this dance has never ceased. Throughout the years, I have sought out many teachers, because I feel that it is important to learn from as many as possible and staying with them long enough to inculcate the best of what they have to offer for my personal learning and dancing style. I am privileged to have had many great teachers, notably Jamila and Suhaila Salimpour, Rhea of Greece, Aisha Ali, and Horacio Cifuentes, among others. I have had master classes and workshops whenever possible with Bobby Farah, Mahmoud Reda of Egypt, Faten Salama, Dahlena and others. Eventually, my emphasis focused upon Modern Egyptian and regional Egyptian styles, but I especially have enjoyed studying other North African styles, i.e. Tunisian, Algerian and Moroccan shikhatt and guedra. I studied Moroccan dance and music in Marrakech and filmed the Marrakech Folk Festival while I was there. Early on I started performing in San Francisco area restaurants and nightclubs and count as my venues among others: El Monsour, the Marrakesh, Kan Zaman, the Northern California Renaissance Faire, the former Grapeleaf (now El Masri), and the wonderful Bagdad and Casbah clubs on Broadway in the fabulous and exciting heyday of live music clubs in San Francisco. My hunt for beautiful assuit continues. I sell some and keep some for my personal collection. 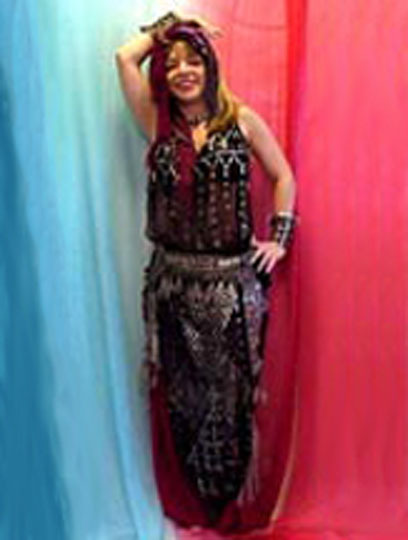 I make tribal fusion bras with both new and antique assuit, selling them on Ebay and through private commission. Feel free to contact me at raresilver [at] sbcglobal [dot] net. I currently reside in Alameda, California and work as a massage therapist. I continue to take classes and perform on occasion to keep my inspiration going. My handsome son (shown in the photo to the right from many years ago) is now grown and has taken up my passion for world travel. I hope you enjoy my articles as much as I enjoy bringing them to you!